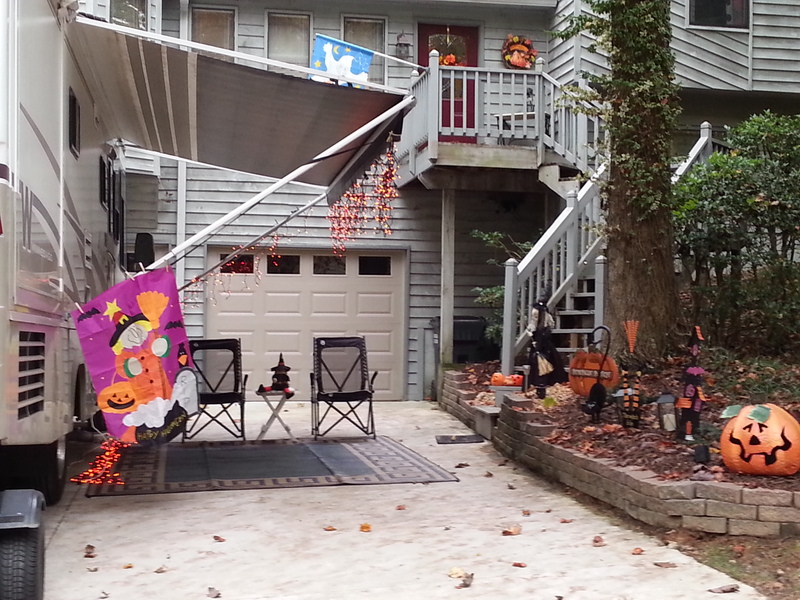 Well, first of all, we got home just fine in one straight drive from New Orleans to Kennesaw and in time for Halloween tricksters (arghh, we had to run out and get some candy). 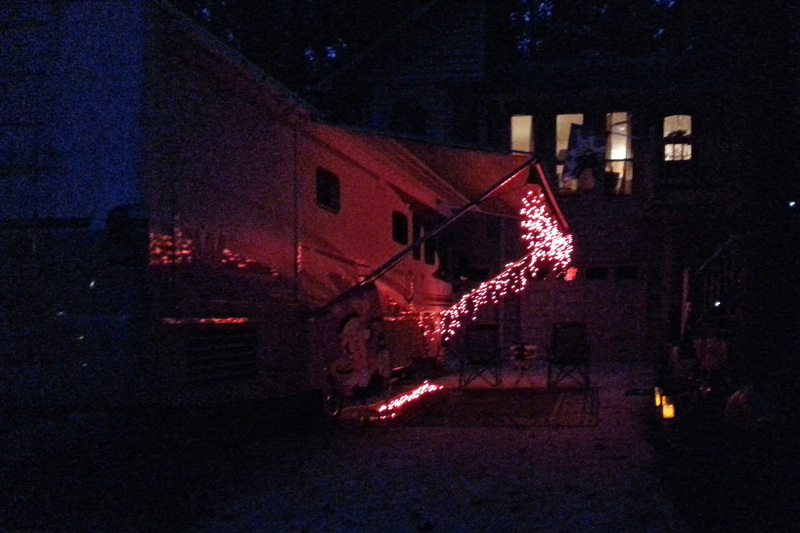 We set up the motorhome to greet kids, with orange lights on the awning, candles and pumpkins to decorate and our two comfy chairs at the ready. Rain was expected but didn’t happen until overnight. I found my bubble/smoke machine and we delighted many youngsters with the smoke-filled bubbles that popped out. We emptied out the van and drove it up to Camping World for repairs and oil change. The microwave needed fixing, the collision repair was scheduled, I wanted an oil change for the engine and generator, plus we had that ragged slide topper to replace. So next on my list of things to do was to go through the many pictures and video clips. Video shouldn’t be a problem, right? Plenty of folks upload their videos to YouTube and share them on the fly, so this can’t be all that hard. WRONG. Well, I did manage to put together two videos so far. Test run was some snorkeling video from Panama City Beach that I took with my JVC Adixxion camera. Well, Media Player will play the video clips, Windows 10 (yes, I upgraded) uses Windows Movies & TV and doesn’t like to play the clips in their present format, MovieMaker uploads video to edit, but does something weird with the audio (just a bunch of clicking and static noises) so that won’t work … finally I found and downloaded GoPro Studio and was able to stitch together the video clips, BUT it won’t let you trim the clips if they were not original GoPro material. I have now found another program that might let me work my magic with the rest of my clips, but I have to learn it first … trakax. It is a free trial with a purchase after 15 days, so I think I have to learn fast. Next, I needed to have a YouTube channel into which I could upload the videos, so that took a little time to craft. 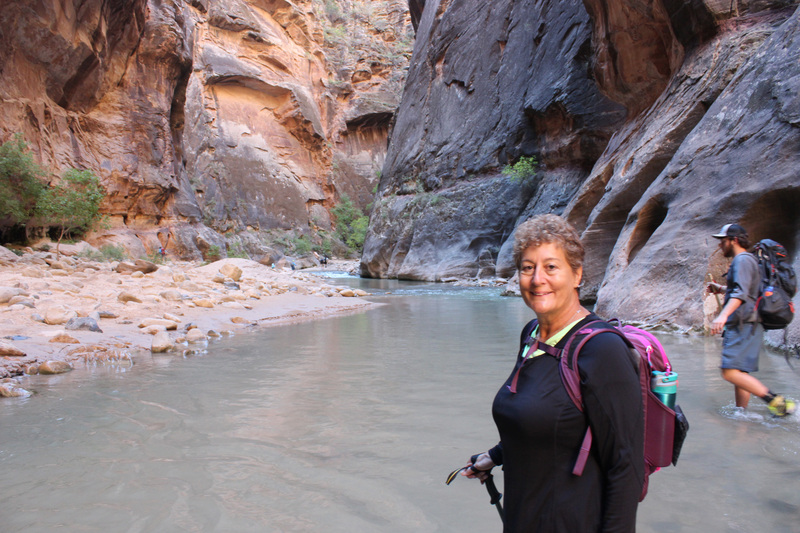 So what I have for your viewing pleasure is a video of our hike up The Narrows. It was an amazing hike as I shared with you before, and this brief video should help tell the story. If this video link works, I will post more as I edit them. I have that snorkeling video ready to upload, but might rework it a bit first. I felt like I was hiking with you! Great video!! Nice video, we will definitely be stopping through there. I started making some YouTube videos also, my first took over 4 hours for a 10 minute video. Anything else you would recommend other than the neoprene socks for that cold water? Wetsuit socks and trail sandals worked for us. Some folks had bare feet, others had flipflops, which would be rough to do for a long stretch and some folks had athletic shoes and mesh shoes. Lightweight hiking poles were a big help. Rental outpost at the base had all that, too. Depends on time of year but still cool in summer I think, so layers of tee and light jacket helpful. I think we probably hit it at a lower water level, too. Waist deep or more would be different for sure.